This summer has provided the opportunity to learn some different things in different ways. I’ve had a chance to do more reading and also to spend some time redoing the Chamber Music Society of Bethlehem’s website and learning more about the music service Spotify. My time traveling to New York has diminished quite a bit compared to what it was this past school year. I did, however, get to see the Mostly Mozart orchestra in rehearsal with the violinist Joshua Bell. On the program was Mozart’s Symphony #36 (“Linz”) and Tchaikovsky’s Violin Concerto in D major. Louis Langrée was conductor and Joshua Bell the violinist. While this was considered a rehearsal, it was practically as good as attending an actual performance. And it’s always a bonus to see how musicians work in a rehearsal. 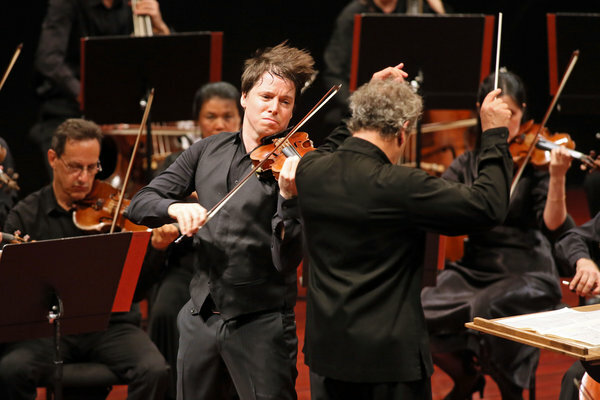 I saw Joshua Bell last season with the New York Philharmonic playing Bernstein’s Serenade for Violin, String Orchestra, Harp, and Percussion. I’ve also heard Bell on several recordings (especially as I’ve gotten somewhat wrapped up in Spotify). Bell is interesting to watch and listen to. His command of the instrument, the music that comes out of it and the room make him arguably one of the world’s greatest living musicians. Listen to Joshua Bell play the Tchaikovsky Violin Concerto in D Major (with Michael Tilson Thomas and the Berlin Philharmonic on Spotify.